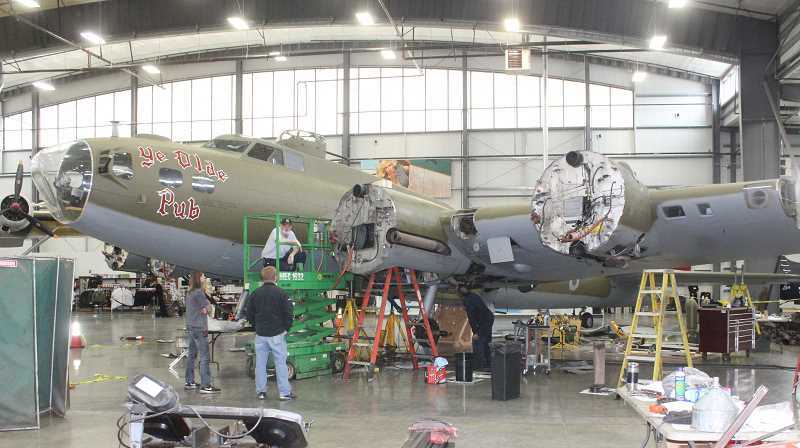 Erickson Aircraft Collection's vintage B-17 bomber, bearing the image of a pretty girl in cutoffs and the name "Madras Maiden" on its silver fuselage, has been repainted olive green and renamed — at least for now. Michelle Forster, assistant manager of the Erickson facility in Madras, which features World War II airplanes, explained the new look. "We are on contract with the Liberty Foundation, which leases the plane for veterans' tours. They had it repainted and renamed 'Ye Olde Pub,' based on a plane in the book 'A Higher Call,'" she said, noting Delta Airlines did the painting in Georgia. "The paint used to be silver and it was a big job to repaint," Forster said, noting it will stay that color for a while. "At some point, they may make a movie of the book, and the plane will be ready for it." The new paint wasn't the only change. "The plane in the book was a B-17F, and the Madras Maiden was a B-17G. So, to make it more correct, the chin turret (in front, underneath the fuselage) and the tail were modified," she said. In fact, the chin turret was taken completely off. The Liberty Foundation has a renewable annual lease on the B-17, and typically has it nine months a year, flying from state to state on tours honoring veterans and focusing on the history of World War II. The plane is only in Madras three or four months a year. Forster said the true tale of "Ye Olde Pub" and its crew "is a story they can tell and the history lesson behind it. The book is about a German fighter pilot who could have shot down a B-17 crew and didn't." In preparation, the plane returned to Madras at the end of February, where it has been undergoing winter maintenance. 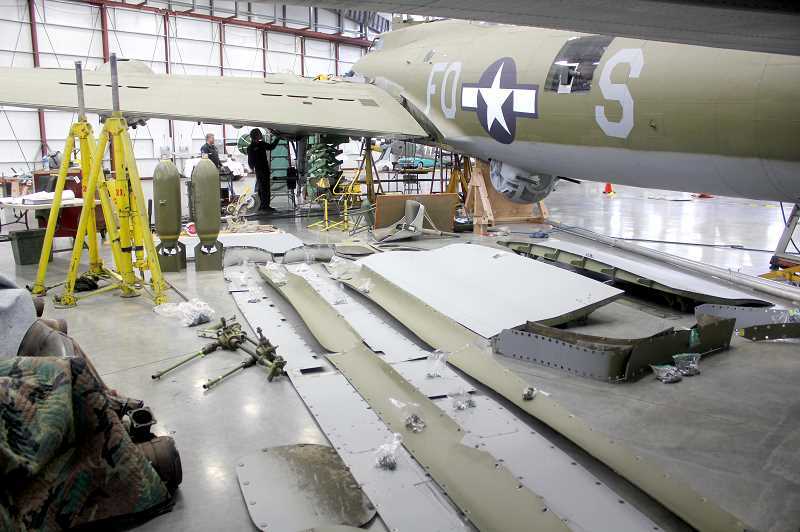 During maintenance, a six-man crew has to remove the B-17's wing tips and propellers. "They remove the wing tips so they can check for corrosion. The plane is hardly ever hangared when it's on tour and just sits outside," Forster said. The aircraft is inspected for cracks on the wings, fuselage, and tail wheel, and engines and landing gear are checked. "They fix things, and sometimes send things out to be overhauled," she said. Once decisions are settled about the movie, she said the Madras Maiden will reappear, noting, "When the Liberty Foundation returns the plane, they are responsible for returning it to its original paint." Available at the Erickson Aircraft Collection's gift shop, the book "A Higher Call," by Adam Makos, with Larry Alexander, is one of the most amazing stories of World War II. According to web information, the book details the 381st Bomb Group, which flew B-17 "Flying Fortresses" in combat from 1943 to 1945, bombing aircraft and industrial targets in France, Norway, Brussels and Germany. Among the pilots was American Charles "Charlie" Brown, and battle-hardened German pilot Franz Stigler, who had flown over 480 missions. On Dec. 20, 1943, after a bombing run on Bremen, Germany, Brown's B-17 "Ye Olde Pub" was severely damaged by ground fire, and Stigler was dispatched to shoot it down, but risked his own life by making a different decision. The crux of story is that good people, thrown into a war situation, are still able to find the compassion and courage to do good — even to the enemy.